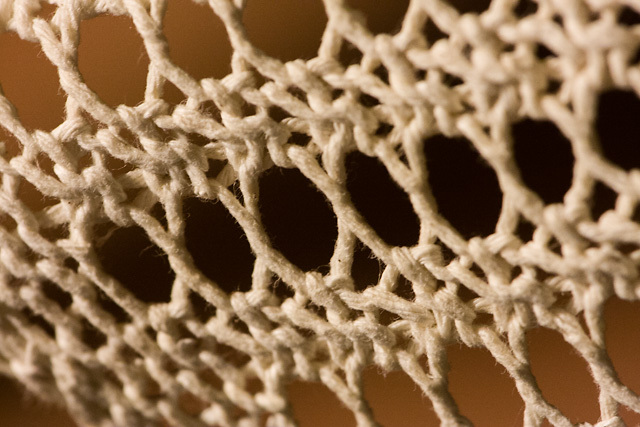 This is a close up photo of a crocheted table cover in our living room. We were watching a movie, when my eye wandered and I suddenly saw this composition. Macro photography is a good way to add some variety into ones pictures. What equipment does one need? Many compact cameras allow you to focus very closely, giving them good macro capabilities. On an SLR, a dedicated macro lens would be the best solution. Less expensive options are extension tubes or close up lenses, such as the Canon 500D I used for this photo. Close up lenses screw into the filters threads of a regular lens, allowing it to focus more closely. This entry was posted in Photographic Equipment, Picture of the Week. Bookmark the permalink. Looks like a rope bridge Indiana Jones will be using shortly. I’m always amazed how coarse most craft work appears in close up.